Automotive industry undergoes unprecedented changes that are quickly evolving from visionary concepts into reality. And also much more creative evolutions are in the pipeline. One such feature that all OEMs and Tier 1s are working is the concept of connected Vehicles. Broadly, connected vehicles use any of communication topologies to communicate with the driver, other cars on road (Vehicle to Vehicle, V2V), roadside infrastructure (vehicle to Infrastructure, V2I), the cloud (V2C), etc. Apart of basic communication, it is also necessary to analyze and extract information from available data and transmit it to the other end. Embien as always, quickly adapt to the emerging technologies and support its customers with the same. 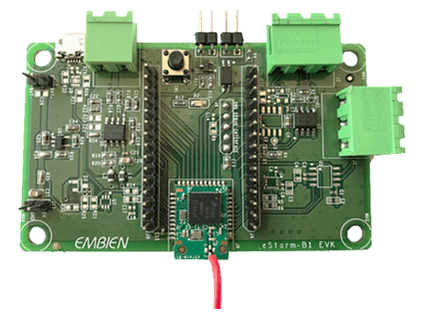 Recently Embien successfully developed a proof of concept for connected vehicles for a customer based on eStorm-B1-EVK, an evaluation kit for automotive grade eStorm-B1 BLE module. In this case study, we will explore more about how eStorm-B1-EVK is used to implement the PoC. One of our Tier II customers from automotive domain who manufacture automobiles (cars, tractors, etc) has approached Embien with a requirement of development of proof of concept (PoC) for a connected vehicle. The requirement was to acquire CAN messages transmitted from different units in the automobile such as instrument cluster, infotainment system, implement custom algorithm on it and transmit the end results of manipulation wirelessly via BLE communication. For development and validation purposes, they have their own test bench setup with instrument clusters, infotainment system and CAN bus analyzer. Real time messages are transferred and received on various message IDs via CAN bus. CAN bus analyzer tool is used to control and monitor the messages. After test bench integration and testing, the PoC has to be integrated to their car via available OBD2 connector. For this requirement, Embien used its readily available solution eStorm-B1-EVK for rapid development and implemented the PoC using the same as a BLE based wireless CAN bus bridge. eStorm-B1 EVK is a evaluation kit for Embien’s eStorm-B1 BLE module. The module is powered by NXP’s automotive grade KW36A BLE SoC with integrated ARM Cortex M0+ MCU. The eStorm-B1 EVK supports automotive specific interfaces including CAN-FD and LIN, thanks to NXP’s KW36A BLE SoC. Necessary power supply circuit and transceiver with standard bus termination, ESD protection diodes are populated in eStorm-B1 EVK to enable CAN-FD communication. A standard 3-pin Screwable type terminal connector was provided for external CAN bus connection. 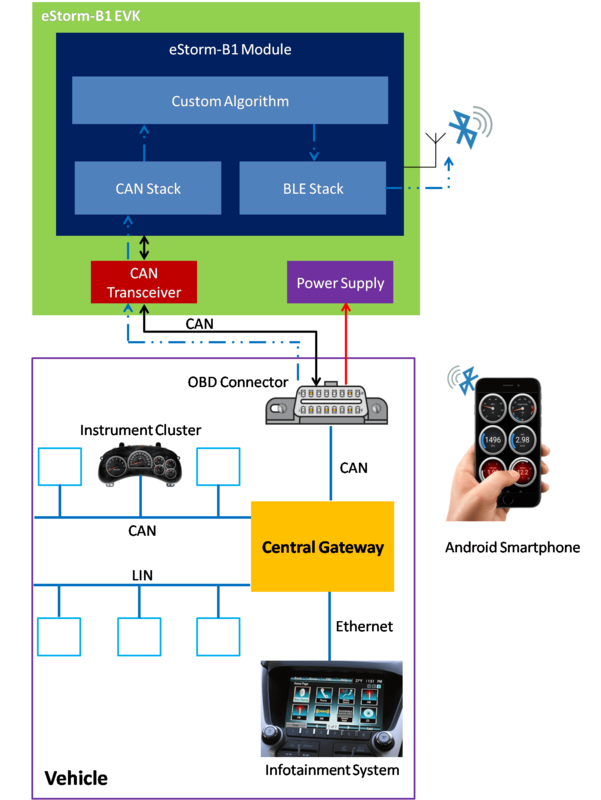 BLE and CAN stacks were readily available which supported rapid developments including multiple message acquisitions from cluster, infotainment system and transmit the same to the Android smartphone via BLE. CAN stack is also optimized to support CAN 2.0 including Baud rate settings, time quanta settings, CAN message ID filters, allocation of message buffers, etc. Software filters were enabled to acquire the CAN messages from particular message IDs and messages from 28 different IDs were acquired simultaneously. Also BLE stack is also integrated with custom profiles including multiple services and characteristics for each useful message. Between acquisition and BLE transmission, there were proprietary algorithms to be implemented in order to convert the message into user understandable format. These algorithms are hardcoded into the application code and programmed the same into eStorm-B1 Module, once again thanks for KW36A’s 256KB user programmable flash memory. 256KB program flash memory enabled the module to be used as a standalone system with BLE connectivity. The processed data that are available after algorithm implementation is sent to the Android Smartphone via BLE connectivity periodically at one second interval. Custom Android app was developed to present the processed data with intuitive UI. Initially all the developments were carried out in customer’s test bench with CAN analyzer tool, including instrument cluster and infotainment system. Once the device is validated, it was implemented in their car for demonstration. The device is interfaced via available OBD2 connector. Power supply to the device was fed from the 12V car battery and connection to the vehicle CAN bus is via 3-pin Screwable terminal connector.